Albert Ashworth’s birth was registered in the second quarter of 1895 in Rugby [although one record stated Warwick], and baptised on 26 May 1895 at St Matthew’s church, Rugby. He was the son of William Ashworth, a groom from Delgany, County Wicklow, Ireland and his wife, Lila Ashworth, and they were then living at 12 Little Pennington Street, Rugby. In 1911, the family were still living at 12 Little Pennington Street, Rugby. Albert was single aged 16 and already working as a ‘Clerk Steel & Co Rugby’ also at home were his elder sister Georgina Jubilee Ashworth, 23, elder brother, William A Ashworth, 19, and younger sister, Grace M Ashworth, 14, all of whom worked at BTH. His eldest sister, Eliza, was already married and living in Birmingham. It seems that in his spare time Albert played full back for the Rugby 2nd XV. The 5th (Service) Battalion of the Oxfordshire and Buckinghamshire Light Infantry was formed at Oxford in August 1914 as part of the First New Army (K1) and then moved to Cranleigh, Guildford and then moved to Salamanca Barracks, Aldershot in February 1915 to be placed under orders of 42nd Brigade in 14th (Light) Division. They mobilised for war and landed at Boulogne on 21 May 1915. Albert’s Medal Card confirms that he also went to France with the Battalion on 20 May 1915. At some stage before mid-August 1915 he had been promoted to Lance Corporal and would have probably been involved in various actions on the Western Front in 1915 including the Action at Hooge, and probably experienced the first flamethrower attack by the Germans in July 1915. It may have been then or soon after that he was wounded, apparently by a bursting trench mortar. Lance-Corpl Albert Ashworth, of the Oxford and Bucks Light Infantry, has been wounded in the knee and sent to an English hospital. His mother, who lives at 355 Clifton Road, Rugby, received a card, posted at Dover on Wednesday, in which he stated he had fine time crossing the Channel, and hoped soon to be all right. According to information supplied by a comrade, the injury was caused by the bursting of a “Trench mortar,” part of the exploded shell striking the knee, but the relatives have not received any direct information as to the nature of the wounds. Previous to enlisting Lance-Corpl Ashworth played full back for Rugby 2nd XV. Albert Ashworth – photo by permission of Rugby Library. With no full Service Record it is uncertain when he returned to France, and but he would probably have missed the Second Attack on Bellewaarde in September 1915, but may have taken part in the Battle of Delville Wood and the Battle of Flers-Courcelette in 1916. At some date he was promoted to Sergeant, and in 1917 there was continuing routine in the trenches whilst the Germans were about to retreat to the Hindenburg Line, the Battle of Arras was about to commence and particularly, the First Battle of the Scarpe (9–14 April 1917) which was conducted in parallel with the attack by the mainly Canadian Divisions on Vimy ridge, slightly to the north. Both these being in part diversions for a major French attack to the south, which in the event was unsuccessful. The Battalion had its full share in the fighting of the first half of this year, suffering the inevitable heavy casualties, but adding still further to its splendid reputation. It took part in the great British offensive which opened on the 9th April, on a ten-mile front, from the south of Arras to the south of Lens; and it was engaged again in the next great offensive on the 3rd May in the same area, losing no fewer than 185 of all ranks in the former and 300 in the latter. March 1st-15th – The Battalion had one tour of the trenches, losing 1 man killed and 5 men wounded. On the 15th marched to Sombrin, and went into training for the coming offensive. March 11th – 31st – This period was devoted to strenuous training, including a rehearsal of an attack on the Harp, the German trench system east of Arras at the junction of the front-line system and the Cojeul Switch. At Christchurch Cave supplying working parties. In Sardine Trench (300 yards). In Roach Trench (260 yards). In Trout Trench (250 yards). In Salmon Trench (150 yards) from its right flank (western end) to M.6.C.61.51, where old German cable trench cuts it at right angles. Total: 960 yards. Units will reach their assembly positions as follows … 5th Oxford and Bucks L.I – from Christchurch Cave by Exit No. 14.F. (G.34.d.02.60). Leading troops to start from Cave at 9p.m., and be clear of the Cave by 10p.m. Route to Assembly Trenches – Rue de Temple – Hatter’s Lane and Halifax to Old German Front Line – Halifax and Arras Way to Assembly Trenches; 200 yards distance to be maintained between platoons. Battalion to be in Assembly Trenches by a.m. on 9th inst. As detailed by O.C. Battalion, 200 yards distance to be maintained between platoons. Battalion to be in Assembly Trenches by 2 a.m. on 9th inst. REPORT OF ATTACK ON THE HARP ON 9th APRIL 1917. The Battalion left the caves at 9 p.m., and was in position in the Assembly Trenches by 12 midnight. No casualties occurred on the way up. There was practically no shelling of the Assembly Trenches till 5.30 a.m. Between 5.30 and 7.30 a.m. the Assembly Trenches were slightly shelled with whizz-bangs and an occasional 4.2-in. chiefly from direction of Tilloy. During this time one officer and one man were hit. At 7.34 a.m. the advance began. There was a good deal of crowding on the right owing to the Battalion on our right losing direction. This was rectified as much as possible by the company officers on the spot. During the initial stages of the advance there was practically no enemy artillery fire, but there was a certain amount of machine-gun fire from Tilloy; this, however, was mostly high and caused very few casualties. As soon as the leading line came in view of the Harp three machine-guns opened fire from behind Telegraph Work and the string of the Harp. Lewis-guns and rifle-grenades were immediately turned on to them, and their fire slackened sufficiently to enable the infantry to go forward. On reaching the front line about 50 of the enemy gave themselves up without fighting, and were passed back to the rear. There was a certain amount of resistance from the back of Telegraph Work and the string of the Harp, but the Germans gave themselves up as soon as our men reached them. About 50 Germans were captured here. C Company and a part of D Company from N.7.a.6.6 to N.7.a.5.3. A Company thence along back line of Telegraph Work to N.7.a.4.1. Remainder of D Company from N.7.a.2.8 to about N.7.a.2.6. B Company thence to N.7.a.2.0. During the consolidation a machine-gun opened fire from about N.7.a.6.9, which caused a certain number of casualties. This gun was knocked out by a rifle-grenade, and was captured in conjunction with a bombing-party of the 9th K.R.R.C. About 20 minutes after reaching the objective the captured position was heavily shelled with 77-mm. and 4.2-in. for about half an hour, and a strong barrage of 5.9 in. put along the bank in M.12.b.l.9 for about one and a half hours. There were no troops advancing over this ground at that time. It only caused a certain amount of inconvenience to communications and very few casualties. About 10 a.m. all hostile artillery fire ceased, and consolidation was completed without further molestation. About this time another machine-gun and its crew were found in a dug-out. They gave themselves up without any trouble. It is impossible to state accurately the number of prisoners taken by us, but it is estimated there were about 100. Three machine-guns were also captured. Our casualties were roughly 5 officers killed, 7 wounded, and about 180 other ranks. The battlefield was cleared of all casualties by 5 p.m., with the assistance of the prisoners. “The Commander-in-Chief has personally requested me to convey to all ranks of the 14th (Light) Division his high opinion of the excellent fighting qualities shown by the Division. The commencement of the great offensive of 1917 has been marked by an initial success in which more than 11,000 prisoners and 100 guns have been taken on the first day alone. The Division has taken a prominent part in achieving this success and maintained the reputation gained last year on the Somme, and added to the laurels of the gallant regiments of which it is composed. Couper, Major-General, Comdg. 14th (Light) Division. 10th April 1917. The bodies in that cemetery were later moved as part of the ‘concentration’ of smaller cemeteries and one Report noted that a new road was being built through part of the cemetery. Albert Ashworth and many of his colleagues were exhumed and reburied in various sections of the Tilloy British Cemetery, with Albert being reburied in Plot IV. D. 23. Tilloy-les-Mofflaines is a village 3 kilometres south-east of Arras, on the south side of the main road to Cambrai. The village of Tilloy-Les-Mofflaines was taken by Commonwealth troops on 9 April 1917, but it was partly in German hands again from March to August 1918. The cemetery was begun in April 1917 by fighting units and burial officers, and Rows A to H in Plot I largely represent burials from the battlefield. The remaining graves in Plot I, and others in the first three rows of Plot II, represent later fighting in 1917 and the first three months of 1918, and the clearing of the village in August 1918. These 390 original burials were increased after the Armistice when graves were brought in from a wide area east of Arras and many smaller burial grounds including the Telegraph Hill British Cemetery, Neuville-Vitasse. The cemetery now contains 1,642 Commonwealth burials and commemorations of the First World War. 611 of the burials are unidentified, but there are special memorials to 14 casualties known or believed to be buried among them. The cemetery was designed by Sir Edwin Lutyens. Arthur’s father died in 1919 and his mother, Lila, was noted as the ‘sole legatee’ and she had been living at 355 Clifton Road from at least 1915, and then at 352 Clifton Road, Rugby [although some misprints are possible!]. She received £18-18-7d owing to Albert on 19 July 1917 and then received a further £15-0-0 gratuity on 21 October 1919. Albert Ashworth was awarded the Victory and British medals and the 1915 Star. He is also remembered on the Rugby Memorial Gate and on his family’s grave – ref: K691 – in the Clifton Road Cemetery, Rugby. This article on Albert Ashworth was researched and written for a Rugby Family History Group [RFHG] project, by John P H Frearson and is © John P H Frearson and the Rugby Family History Group, December 2016. Rugby Advertiser, 14 August 1915. Record of the 5th (Service) Battalion, Oxford and Bucks L.I., 1st July 1916 to 30th June 1917, Compiled by Steve Berridge, http://www.lightbobs.com. Army Registers of Soldiers’ Effects, available on Ancestry.co.uk. Clifton Road Cemetery, list of names extracted from the Rugby Family History Group (RFHG), CD of Monumental Inscriptions. 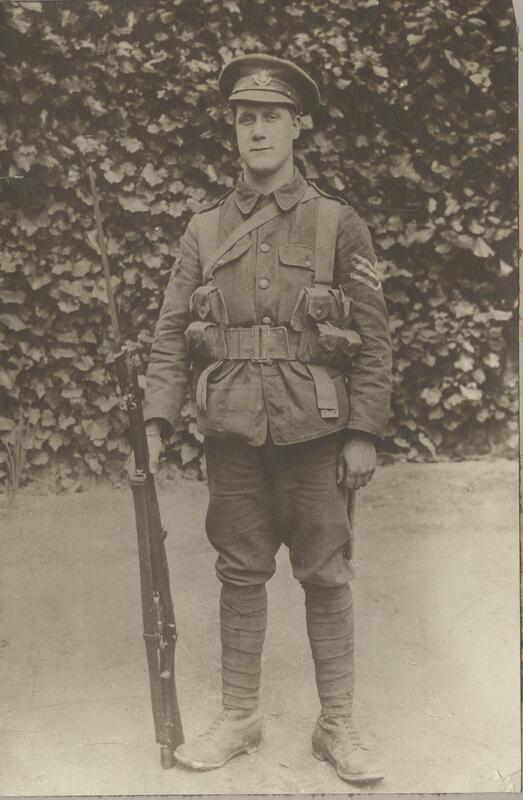 This entry was posted in Biography and tagged 1917, Ashworth, Battle of Arras, Oxfordshire and Buckinghamshire Light Infantry by Christine. Bookmark the permalink.